When the average person thinks of an athlete’s diet, they usually think of protein – and lots of it. The protein obsession in this country has gone so far as to create a lucrative market for powdered protein supplements, all targeted at people who want to gain muscle mass and lose fat. Protein is essential for building muscle, but what if muscle-building benefits could be found in something as simple as an apple? Research suggests that a powerful compound in the peels of apples could not only help you build stronger muscles, but combat excess body fat at the same time. According to the study, published in the journal Cell Metabolism, ursolic acid found in apple peels can not only prevent muscle atrophy, or wasting, but can help build muscle tissue while combating fat. “Muscle atrophy causes big problems. It’s also very common — it affects most people at some point in their lives, during illness or aging. But, there’s no medicine for it. We studied muscle gene activity in people with atrophy and used that information to find chemicals that might block atrophy. One of those chemicals was especially interesting. It’s called ursolic acid and it’s particularly concentrated in apple peels,” says study author Christopher Adams, M.D., Ph.D., University of Iowa. The ursolic acid reportedly works by boosting hormones that help build muscle. These hormones also helped reduce body fat, blood sugar, and cholesterol, suggesting apples should perhaps be on every athlete’s plate. The mice in the study were protected from muscle wasting caused by fasting and nerve damage by the ursolic acid. These same mice also developed larger and stronger muscles than those who didn’t receive the ursolic acid. Interestingly, the ursolic acid mice didn’t become heavier than the others—despite increasing muscle weight, their fat weight decreased. In addition, these mice avoided fatty liver disease despite eating higher fat diets than the control group. While the researchers would like to use this information to create a pharmaceutical money-maker for Big Pharma, you can obtain the benefits of ursolic acid by simply eating apples. You don’t need a pill or a powder for that. Don’t peel your apple because that’s where the “good stuff” is; apple peels have also been shown to be 6 times as powerful as the flesh at reducing blood pressure. 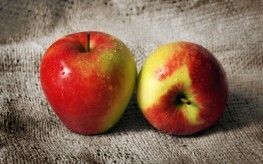 And always purchase organic; apples are part of the “dirty dozen”. Whether you are looking to make serious strides in the gym or simply maintain good overall health, an apple a day may do a whole lot more than keep the doctors at bay. Are all the different colors of apples equal in the amount of ursolic acid or is there one color in particular that's better than the others? That's great news. I love apples and I always purchase the organic ones. I eat about $10 worth every couple of days. I'm glad I read the entire article to finally find the last sentence of the next to last paragraph, "And always purchase organic; apples are part of the “dirty dozen”. I would like to have seen that in the FIRST sentence. Apples are maybe first on the list of heavily sprayed fruits. I not sure that even peeling them gets rid of the toxins from the sprays.